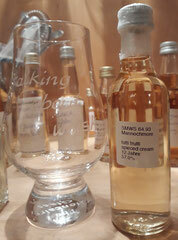 The second Mannochmore sample from the sample exchange with Norman is a bottling of the Scotch Malt Whisky Society with the lovely name 'Tutti frutti spiced cream'. I have a couple of SMWS bottlings on my shelf, but I haven't tasted any yet. I only heard good things about it. After the first Mannochmore didn't really please me, I'm very excited. Aroma: Sweet caramel biscuits with fruit topping. Oranges, apples, pears, apricots and mango. A little ginger, cloves and cinnamon. A beautiful harmonious potpourri of fruits and spices and despite the 57 % no disturbing alcohol. I forgot the pineapple. Taste: Wonderfully soft, sweet-spicy start, warming. With the second sip the fruits come. More tropical here than in the nose. The caramel biscuits are a little burnt here, but not too much. The ginger is stronger. With a little water there is more harmony again. The alcohol is more present in the mouth than in the nose. Finish: I would have expected it to last longer. Medium long, sweet-spicy. At the very end light bitter notes. Conclusion: The name says it all here. Many fruits, well balanced with fine spices.